Turnips are in season now and an abundance of greens and roots are being harvested to fill CSA baskets and farmer’s markets across the United States. Native to western Asia, the turnip has served as food for humans and their livestock for centuries. In fact, the humble turnip was a daily staple in Europe long before potatoes were. As a member of the cruciferous vegetable family, which includes broccoli, kale, radishes and cabbage, the turnip is considered a top veggie when it comes to disease-preventing phytochemicals. Studies have shown that these compounds help the body both ward off and detoxify cancer-causing substances. Turnip roots are also low in calories, a good source of folic acid, calcium and iron, and high in vitamin C. In fact, turnip juice has twice the amount of vitamin C as orange juice. Turnip greens are supercharged with vitamin A (through their concentration of carotenoids such as beta-carotene), vitamin C, vitamin E, vitamin B6, folate, copper, calcium, and dietary fiber. Use turnip greens wherever you would use beet greens, kale, cabbage or collard greens. Those with thyroid conditions should limit their intake of turnips (and all cruciferous veggies) since they contain substances called goitrogens, which can interfere with the functioning of the thyroid gland. For others, however, the turnip can be very healing. According to traditional Asian medicine, eating turnips improves circulation of qi (energy) and is healthful for the blood. Nutritional researchers suggest that the turnip is an effective food for clearing mucus and treating bronchial disorders such as coughs, bronchitis, and asthma. 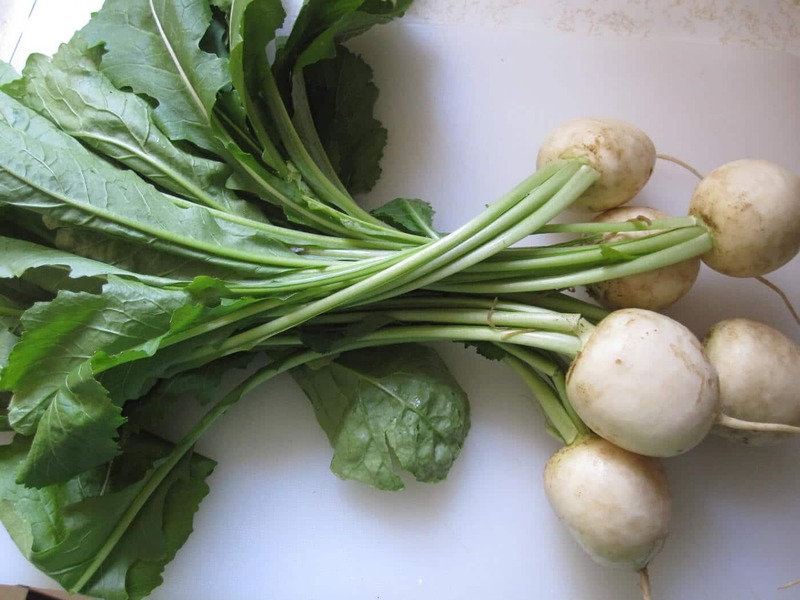 Eating raw turnips is said to help disperse lung congestion. Turnips come in many shapes and sizes, but the most common varieties have creamy white skin with shades of purple, reddish pink, or green. If you choose yellow, chances are you’re holding a rutabaga–a cousin to the turnip, which is also in season at the same time. While large turnips are impressive, the smaller the turnip, the sweeter the taste. A good turnip will be smooth and heavy for its size. If it comes with greens attached, remove the greens before storing the turnip in a root cellar for up to four months, or in the crisper compartment of the refrigerator for a couple of weeks. Store greens in a plastic bag in the refrigerator for up to three days. Here are two turnip salad recipes—one for the root and one for the leaves—so you can get the most nutrition out of this delicious root vegetable. Mix all the marinade ingredients and a large bowl. Remove any hard stems from the turnip greens, then “roll” the leaves, cigar-like, before slicing into strips. Add the greens to the marinade and “massage” or knead them a bit until they are well coated and wilt. Allow to marinate for at least 30 minutes—the longer they sit the better the flavor!